SMS allows having multiple simulations for the same project with models such as SRH-2D, ADCIRC, and STWAVE. Furthermore, SMS 13.0 lets you run and manage multiple simulations running at the same time using the new Simulation Run Queue dialog. The Simulation Run Queue is a modeless dialog, meaning you can continue using SMS while simulations are running. Once a model run has started for a simulation, you are free to start building a new simulation, even one using the existing components. Completed runs may be visualized in SMS while additional runs are still in process. You must click Load Solution to load the desired simulation solution into the project. This does not happen automatically when you click Close as it did before. If you try to run a simulation already in the queue, you will be prompted to remove the simulation from the run queue before it can be run again. If changing an active simulation’s settings, renaming the active simulation, or taking any action that affects a simulation currently in the queue, you will be asked to remove the simulation from the queue prior to making the changes. 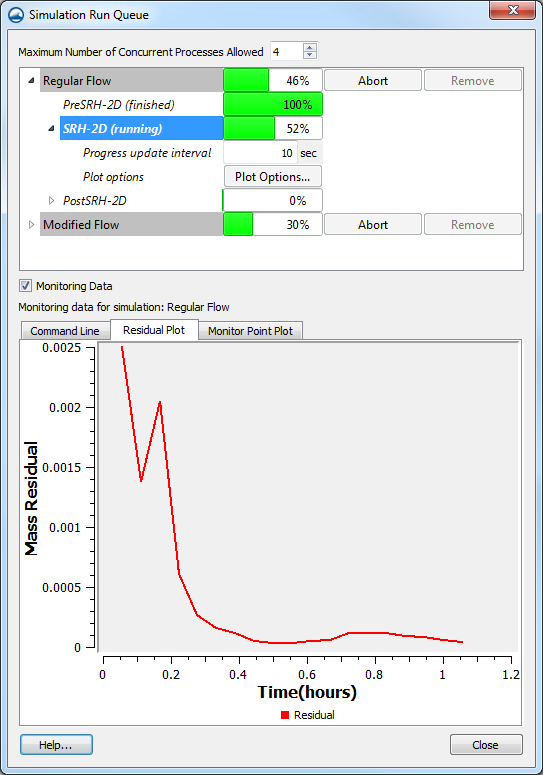 With the Simulation Run Queue, diagnostic information—such as monitoring plots—can be displayed during model runs. By turn Monitoring Data off or on, you can watch command line results and residual plots. Options also exist for changing which plots are displayed in the run queue. Selecting a simulation causes the Plot Options button to appear. In the Plot Options dialog, you can choose which plots to view. You can view Residuals, Monitor Points, and Monitor Lines, and change the options associated with each of these. Now that you know a little more about the Simulation Run Queue dialog in SMS 13.0, try it out today!